A college intern shouts “It’s alive!” directly at the camera. He plays it off as a joke, but there’s genuine excitement in his voice all the same. He’s aware that there’s a movie called Frankenstein, clearly. He’s not aware of the irony that the scientist behind his research team is named Frank, nor will he notice that their efforts to “cure” death are doomed to a very familiar comeuppance — not until it’s too late anyway. When Colin Clive shouted that line in 1931 he was theatrically depicting the pure, grandiose hubris of a man overwhelmed by the fact that he’s played God. The sentiment belonged to Dr. Frankenstein and Dr. Frankenstein alone. When Evan Peters does it in 2015, he’s equally pleased that his life has momentarily crossed paths with that one old movie. In a way, he knows how to feel because Colin Clive told him how. And there you have it: modern film in a nutshell. Every story has presumably been told. Every emotion has been felt. We can access all of it on our phones in a second, and yet as human beings we still have to feel everything in the real world. Love, hate, fear, lust, joy, etc. are now inseparable from the quotes in the movies where we first experienced them. That’s the challenge horror filmmakers face today. Why The Lazarus Effect? Why now? Almost two hundred years after Mary Shelley published Frankenstein, what could a movie about a scientist who sets out to create life really tell us that we don’t already know? What could it do to surprise us or make us feel the sting of life and death in a new or meaningful way? It’s not enough to be earnest and direct anymore. It’s not even enough to pass the time amiably. The film does both of these things with modest success; but I don’t think it’s a coincidence that the most popular, successful horror films in recent memory meet the audience where they’re at in the cold world of instant gratification and IMDB before guiding them into the unknown. 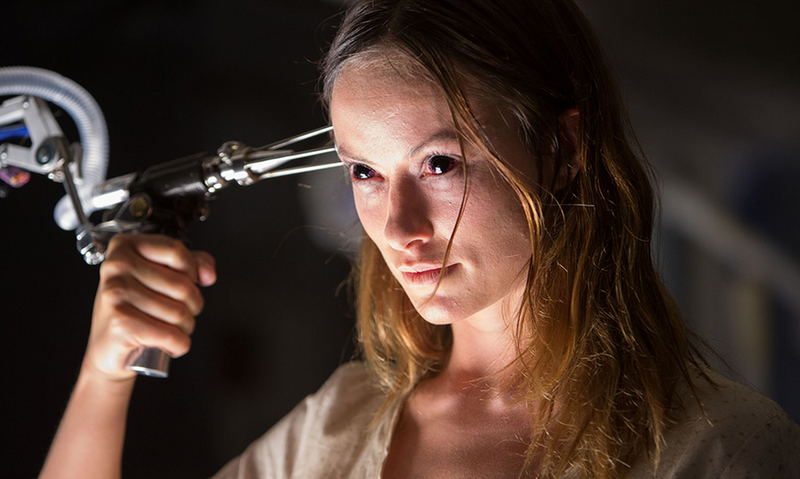 If the goal of The Lazarus Effect was merely to scare its audience then I might be getting a little nitpicky. I don’t think that’s really its goal though. 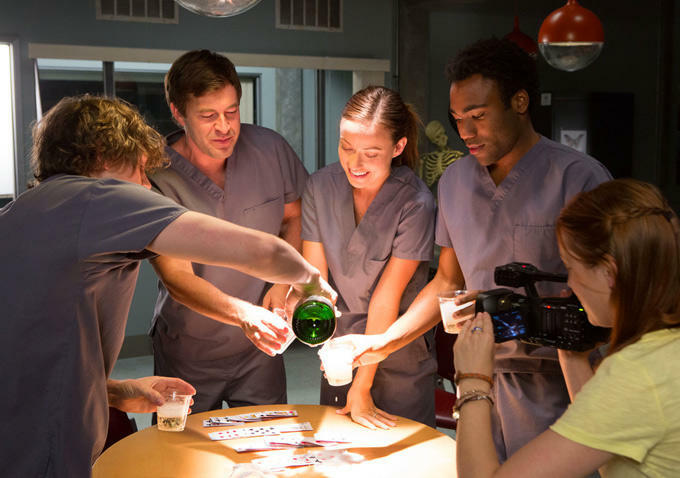 If the film genuinely wanted nothing more than to be fun and scary, it would have eked more tension out of the early experiments Frank (Mark Duplass) conducts with his wife Zoe (Olivia Wilde) and their team of researchers (Donald Glover, Evan Peters, and Sarah Bolger) to develop a serum that reverses the process of death. It would capitalize on its silliest possibilities, like the dog whose brain activity is accelerated by the team’s serum once it’s resurrected. It would have more shock scares and fewer arguments between Frank and Zoe about whether there’s life after death (he believes in science, as does everyone with a three day beard. She believes in heaven, as does everyone who wears a cross necklace); it would have more tense sneaking around and less psychobabble about the human brain. And then there’s that cast. What is that cast? Mark Duplass is more prominent as the writer/director of films like Cyrus and Jeff Who Lives at Home than he is as an actor (not to mention his role as Pete in The League). Olivia Wilde has become a mainstay in independent dramas, working on Joe Swanberg’s Drinking Buddies and Spike Jonze’s Her. Donald Glover (Community’s Troy Barnes, Emmy-nominated rapper Childish Gambino) is a cultural force and one of the most charismatic presences working in television, music, or movies today. Why his talents are necessary for the meek, uninteresting intern Niko is beyond me. If this were the cast of an Oscar-nominated Fox Searchlight comedy I would understand, but why is this level of talent necessary for a film so silly and predictable? I mean everyone I just listed has actually written better, more engaging scripts than this one. I think director David Gelb (whose only feature thus far is documentary Jiro Dreams of Sushi) aspires to the same modern, intellectual school of horror as Ty West’s House of the Devil and The Innkeepers and Adam Wingard’s You’re Next. Those films subtly manipulate familiar stories about satanic cults, haunted houses, and sociopathic home invaders to reflect the needs of their millennial audience. For instance, You’re Next is about a traditional upper class American family who are assaulted by masked killers. However, the usual reverence given to the “nuclear family” in these sorts of films is gone, reflecting the growing cynicism towards Reaganite “family values.” The Innkeepers is about two overnight hotel workers who start communicating with lingering spirits in the basement. Their naïve optimism in dealing with these forces shows that they don’t understand the consequences of wasting their own lives. 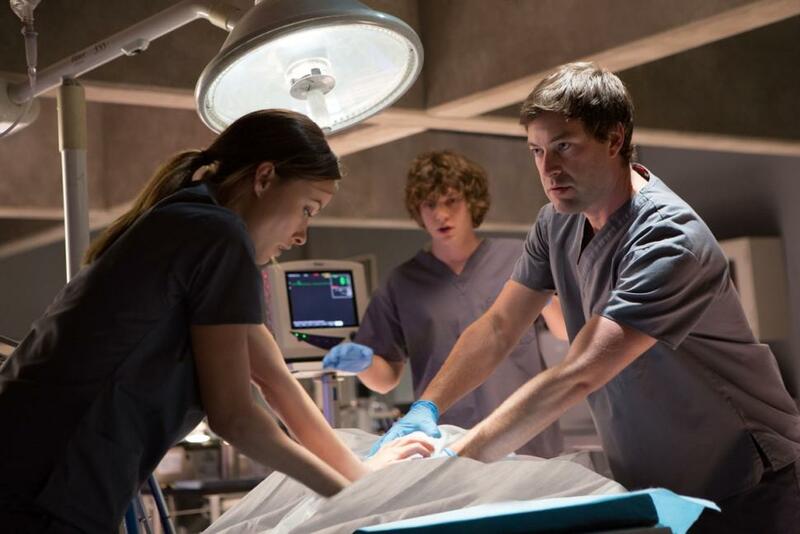 What does The Lazarus Effect add to its discussion? I don’t want to die. I don’t want my loved ones to die. I want to believe that no matter what I do to the earth or to the people around me, it will all turn out okay in the end. Frankenstein and its ilk of tragedies make me feel the overwhelming terror of getting in over my head when playing with forces beyond my control. They give some semblance of reason to the order in the universe, even when it seems unfair. Other stories have riffed on this theme successfully. Recently there was Splice, which repackaged the myth as a cringe-inducing tale on parenting and budding sexuality (we just don’t talk about that third act). I also have a soft spot for Tim Burton’s Frankenweenie, which added a happy ending to the story, arguing that maybe in a world with nursing homes and rampant social apathy, we already focus too much on what we should be afraid of and not enough on how attached we are to the people we love. Lazarus touches on some tantalizing possibilities. The serum that revives the dead subjects accelerates brain activity, changing their personality and giving them special powers. The latter part is pretty standard and boring, but I was interested in the idea that maybe if we knew more about the world, if we had more control, we might become different, perhaps worse people in ways we never expected. Zoe says of the existence of the supernatural, “We don’t know.” Frank replies, “We don’t know yet,” and the fallout of the story suggests that maybe Frank’s scramble for control is ill-conceived and there are some places where science won’t make us better people. This could spark an interesting debate over research ethics and the foundations of humanity. Maybe the egocentric, emotion-driven Frank is the villain and the corporations and institutions besetting him are somehow the grounding heroes. The script never takes the time to explore this in a meaningful way. Maybe that’s the point though. Maybe that’s where this film is more committed to its premise than any that has come before. The point of Frankenstein is that we demand satisfaction from a world that is inherently unsatisfying. I was consistently excited by possibilities the film aroused, to the point where I could say I actually enjoyed it. There’s something inherently exciting about stories that hint at worlds beyond the edge of the frame. I wanted to know more about that chemical our brain pumps into our bodies just before we die. I wanted to wrack my imagination over the way one brain might influence another across space. I wanted this quiet one room thriller to suddenly branch out into a larger, paranoid world of big corporations and, eventually, the very boundary of heaven and hell. Every time the film killed or forgot about one of these tangents I wanted to invent a magic serum to bring it back to life. But as I’ve learned from hundreds of stories about miracle workers dating back to Jesus and Lazarus, sometimes it’s best to embrace the mystery. Sometimes the big reveal is a disappointment. Sometimes it’s best to quit while they still want more.